Faded orange geep No. 982 blends perfectly into the delicate spring colors on May 1, 1969. Baltimore & Ohio operator Ron Henderson often gets eggs from the local farmers to sell to the train crews, but today it’s just a wave that goes to engineer Charlie Ogan as he passes Black Fork Junction. The so-called “Ironton Run” was the quiet country end of the 400-plus mile Detroit, Toledo & Ironton. The name “Ironton” always used to conjure up visions of a huge industrial city whose night skies were forever illuminated by the glow of blast furnaces and Bessemer Converters. The name Detroit, Toledo & Ironton thus implied a multiple-track carrier of ore trains, coal drags and urgent merchandise manifests. After all, any railroad going to Ironton would have to live up to the name. Names can be deceiving. Although it still has one coke plant out on the east end of town, Ironton’s chief contribution to the tri-state area of the Ohio River valley stems from the fact that Ohio’s liquor laws are more liberal than those of Kentucky or West Virginia. The main line of the Norfolk & Western blasts through the middle of town, but the highballing coal trains and manifests acknowledge Ironton with little more than a few bleats on the air horn. The DT&I enters town like a streetcar by running down the middle of—you guessed it—Railroad Street. The DT&I freight house no longer serves its intended function, and the tracks pass by it, cross the N&W and slide alongside the main line to a small and featureless interchange yard. This is quite a contrast to Chesapeake & Ohio’s huge Russell Yard complex just across the river, and those steel mills you expected to find in Ironton are also across the river in Ashland, Ky.
What Ironton lacks as an industrial complex it makes up for by being a picturesque residential river town, and what the DT&I lacks as a heavy duty main line it makes up for by being a very photogenic hill country branch. The DT&I between Detroit and Springfield, Ohio, is the heavy duty industrial bridge line that the name implies, but the traffic begins to dwindle down south of Springfield. Interchanges with N&W and C&O near Waverly pretty well mark the limits of bridge traffic, but DT&I’s “main line” continues on down to Jackson, Ohio, the site of the road’s main car repair shops. Jackson has a modest freight yard and enough local industries to keep one afternoon switch job busy. One road freight a day, SJ3, comes into Jackson from Springfield. It arrives in early afternoon and is called to return to Springfield as JD4 about 2:00 a.m. 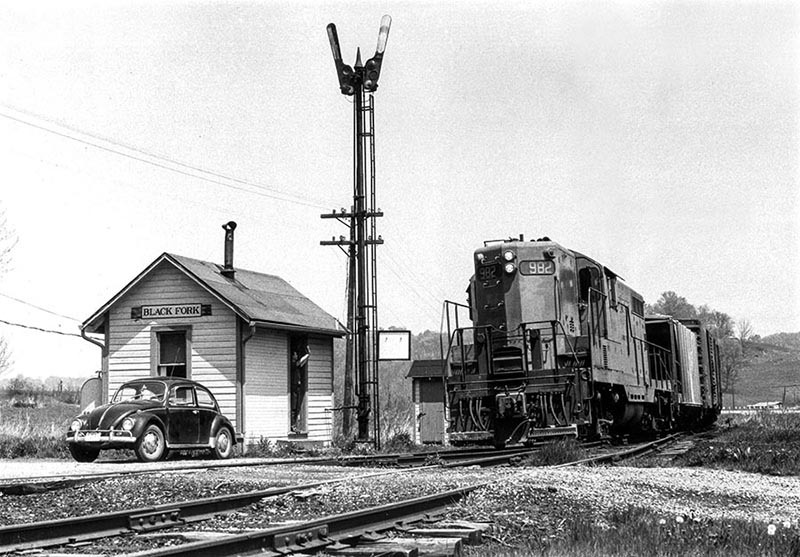 The 52 miles of railroad south between Jackson and Ironton is served by Job 90, the “Ironton Run.” Called about 11:00 a.m. at Jackson, this daily-except-Sunday local makes a turn to Ironton and returns in time to make the connection with outbound JD4. Road units off inbound SJ3 supply motive power for all activity at Jackson. The afternoon Jackson switch job uses the lead unit off SJ3, which is naturally facing south. This same unit is then held for the Ironton Run the next day. The single unit used on the Ironton Run is not turned at any time and gets back into Jackson running long hood forward. This unit is then added to the rear of JD4’s outbound consist and when JD4 leaves town, the only unit remaining is the one that had been used on the switch job. When the photos in this article were taken in 1969, Geeps were the standard power on the south end of the DT&I, but GP40’s and GP38’s are used today. Incidentally, the DT&I is one of those railroads that is sensitive about railfans trespassing on company property to get photos, so stick to pictures out in the country and don’t wander around in Jackson yard. No. 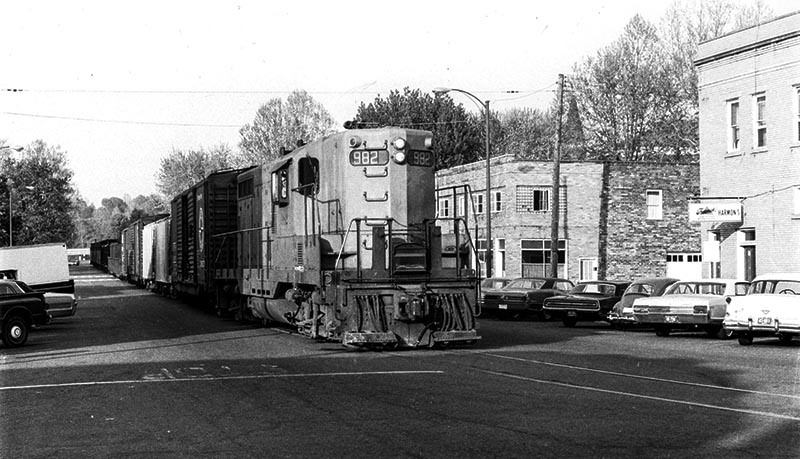 982 makes like a streetcar entering Ironton, Ohio, in 1969. The Jackson, Lawrence and Scioto County areas of southeastern Ohio served by the Ironton Run have large deposits of clay which makes excellent fire brick, and it is these clay and brick products that provide most of the revenue on the line. Ohio Firebrick, Cambria Clay Products, Durex Pyro Refractories and International Minerals & Chemical Corporation all have clay plants right in Jackson that are served by the DT&I’s afternoon switch job. The Ironton Run covers its first 24 miles without doing any work at all, because from Jackson to Bloom Junction it is running on trackage rights over the old Baltimore & Ohio Portsmouth Subdivision. Listed in the B&O employes’ timetable as second class train 101, the Ironton Run is worked by train orders from the B&O operators at Oak Hill and Black Fork Junction to keep it clear of the B&O’s own Wellston-Edmonds-Hamden-Wellston local. The Ironton Run and the B&O local will usually meet somewhere between Jackson and Bloom Junction. Although the DT&I now runs low-nosed GP40s or GP38s, the only change on the B&O job has been to get its Geep painted in bright Chessie System colors. After getting back onto DT&I rails at Bloom Junction—just a switch in the middle of nowhere—the Ironton Run’s first work is at the International Minerals & Chemical (IMC) clay plant at Bondclay, an intriguing complex of buildings tucked into a hillside. From there it is on south through a picturesque valley to a siding at Superior, just north of the crossing with Highway 522. 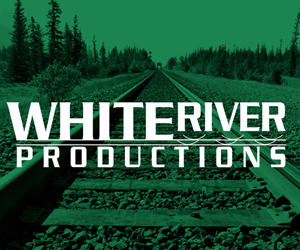 A mile-long branch heads east from the siding to the Marquette Cement plant, a good customer for the DT&I. Reasonably good back roads follow the DT&I for most of the run to Ironton, but some turns get a bit tricky. If you plan to follow this line, you can save a lot of frustration by following it northbound to learn the roads. This way, most of the tricky turns are “trailing point” intersections. 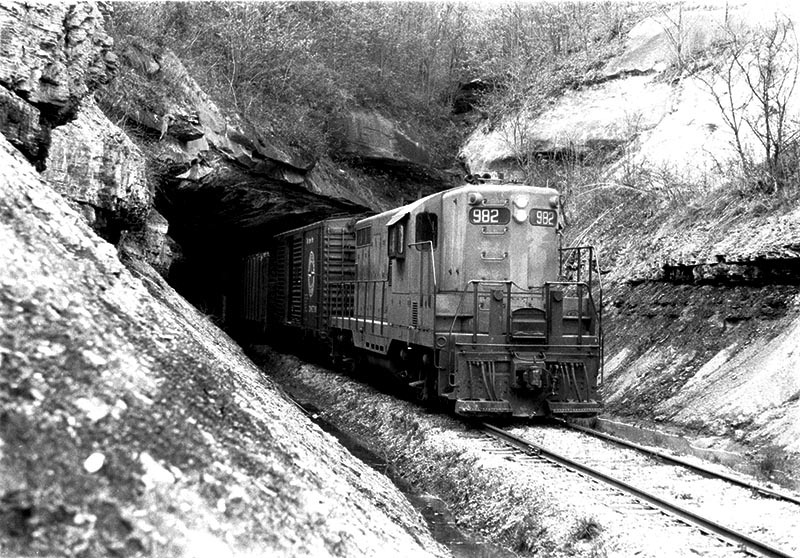 The black hole of Royersville Tunnel was a coal seam, note timbers inside mouth. The line continues to follow the valley south from Superior and swings over quite close to Highway 93 at Pedro. A wye and a spur at Pedro goes back past a small coal loader to the Lawrence Refractories clay plant complex east of the highway. Right out of Pedro, the country becomes quite rugged and the DT&I punches through a ridge in a very unique tunnel. The “Back Hole” of Royersville Tunnel was dug before the Civil War. It follows a coal seam, and the natural rock portals show this quite clearly. The south mouth of the tunnel is much wider than the roadbed, and open timbers support the roof right along the tracks. Crew members report that the tunnel narrows down to a “conventional” bore near the middle, although none would venture a guess at the overall length of it. The tunnel was quite a problem with steam engines since it lies on a fairly steep grade northbound, and crews would try to “get a run for it” and then coast through the bore itself. South of the tunnel, the line twists and turns following a creek down toward the Ohio River. The hollow seems to get more narrow and crooked as the line nears Ironton, and then suddenly it is out into an open valley, punching under Highway 52 and out into the middle of Railroad Street in Ironton. The Ironton Run does most of its work on the southbound run, and the return trip consists mostly of simply picking up the Jackson cars that he left in the sidings on the way down. The unit is running backwards, but it is not much of a problem as the Ironton Run makes its way home in the darkness. From Bloom Junction to Jackson it is officially DT&I 108 on the B&O. Upon arriving in Jackson, the “through” cars go onto JD4 and the diesel is added to the rear of JD4’s set. The single unit for tomorrow’s Ironton Run is already idling nearby. POSTSCRIPT: The Detroit, Toledo & Ironton was operated as an independent subsidiary of the Pennsylvania Railroad from 1929 until 1970, when it was sold off following the bankruptcy of Penn Central. The DT&I was acquired by Grand Trunk Western in 1980, which promptly abandoned the south end of the railroad past Washington Court House, Ohio, including the picturesque “Ironton Run.” -O.M.V. 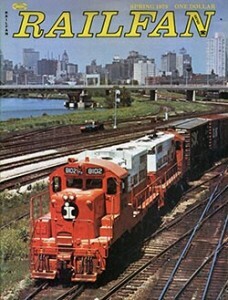 This article originally appeared in the Spring 1975 issue of Railfan.